Edisonstraat in Hoogeveen. A road redesign which had fatal consequences. What lessons can be learnt ? On the tenth of February, a 63 year old employee of the Fokker aircraft company in Hoogeveen was seriously wounded at 7:30 in the morning while cycling to work as a result of a collision with a car driven by a 19 year. The next day, he passed away in hospital. Shortly afterwards, one of his colleagues contacted me and asked that I take a look at recent changes in and around Edisonstraat where the collision occurred. Edisonstraat was redesigned a few years ago as part of an attempt to improve the flow of motor vehicles on the ring-road to the east of Hoogeveen, especially to benefit car commuters who had suffered from congestion in the past. Particularly of importance to this blog post, a main road through a mainly industrial area was re-aligned because traffic jams formed there. It is quite possible that the new design which resulted has met that primary aim, however for cyclists the new arrangement is undoubtedly less safe than before. It would be unfair to say that cyclists were completely forgotten during the new works because fresh red asphalt cycle-paths are evidence of there having been some thought about those who cycle. However the quality of design for cyclists is poor. The end result is requiring cyclists to take a detour if they wish to remain safe, or to use roads which are more dangerous now then they used to be if they wish to make an efficient journey. What's went wrong with Edisonstraat ? The cycle-paths which used to run alongside Edisonstraat provided a direct route to work for many people in Hoogeveen. In particular, they led directly to and from one of the biggest employers, Fokker, at Edisonstraat 1. Not only did these cycle-paths offer a direct route for cyclists, they were had also proven to be extremely safe. There are no recorded incidents involving cyclists on the ongelukkenkaart. Unfortunately, when main roads in this area were re-aligned to increase capacity for more motor vehicles the cycle-paths were removed along Edisonstraat leaving cyclists to have to ride on the road amongst motor vehicles. The original direct north-south cycle-route has been replaced by a route which involves a detour and two sets of traffic lights. In a distance of just 200 m, these two sets of traffic lights can easily add more than a minute to journey times. Unsurprisingly, there is evidence from tyre marks on the ground around the junction that many people on bikes avoid using the new longer route but find more direct routes which follow a line similar to the older faster route even if these are in some cases dangerous. It's clear from watching the way people use this road and junction that not just a few but many people choose not to take the suggested detour. Most of them do so by riding on the "wrong" side of the road across the junction following the route that I take in the last part of of the video above. Unfortunately, the new road design makes even this relatively dangerous. The fatal collision occurred on a part of Edisonstraat where cycle-paths had been removed. If those cycle-paths had not been removed then the same collision could not have happened. Therefore it is very difficult to come to any conclusion which doesn't include removal of this safe cycling infrastructure as at the very least a contributory factor. The blue line shows a possible relatively safe new route. A new route should be constructed which restores safe cycling on the direct north-south line. This could be constructed on the west side of Edisonstraat. There is plenty of space. In addition, action needs to be taken at the new crossing to reduce traffic speeds and make crossing the road safer than it is now. However my suggestion of restoring one of the cycle-paths only addresses some of the issues. Re-building the roundabout and restoring cycle paths on both sides of the road around that roundabout would be the best way of restoring the previous high level of safety in this location. Note that it is known that the design of roundabout which was used in Edisonstraat previously reduces the injury rate for cyclists by 87% over an un-signaled junction. Better examples of a similar roundabout design appear to be rather safer again, while this particular un-signaled junction has proven itself to be dangerous. 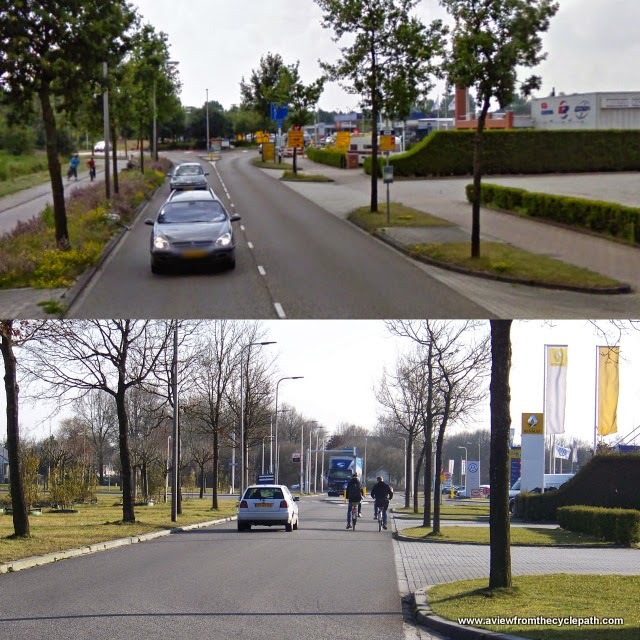 Because this part of Edisonstraat is no longer the ring-road of Hoogeveen, it's clear that planners thought this meant it no longer required a cycle-path for safety. This has been disproven by unfortunate recent events. The road still carries a lot of through traffic from the industrial area of which it is a part. This includes many trucks as well as a lot of commuting traffic. The space where the cycle-paths used to exist has not been re-used for anything else and it would still be relatively easy to re-instate the cycle-path in order to make cycling safe once again on Edisonstraat. There's still plenty of space on both sides of the road for cycle-paths. Still plenty of traffic which cyclists would be better off avoiding. The corner of Edisonstraat and Siemensstraat is a relatively good place for a cyclist priority crossing. Drivers will in any case already naturally slow down for the corner and this can be encouraged further by good crossing design with a raised table and obvious cyclist priority. There is plenty of space here to ensure good sight-lines. Desire lines should not be ignored by planners. The huge number of tyre marks in the grass here show where people actually want to cycle, but the designer of this cycle-path has decided to send them on a detour instead. Unfinished path edges and sharp corners on the path increase danger, especially at times with low visibility. As they leave the city, riders of mopeds limited to 45 km/h are required to join the cycle-path at this point. Cycling infrastructure in rural areas should be suitable for moped speeds. The standard of design for moped infrastructure is often poor across the Netherlands. I don't believe it to be safe to leave a 50 km/h stream of traffic safely at this point and successfully negotiate these kerbs, narrow path and sharp corners at speed. Note that while the budget for this project didn't stretch to sufficiently safe cycling infrastructure, it does seem to have been adequate to pay for a house sized folly. before the fatal collision occurred. That those responsible for the new road and junction felt they had to install signs to tell people that it is dangerous does not inspire much confidence. Perhaps drivers might be careful when they first drive past such a sign, but human beings don't remain in a constant state of alertness over long periods of time. After a short time, signs like this simply become part of the scenery and are ignored. Signs do not solve the root problem of a junction being of a dangerous design. The real solution for dangerous roads is to redesign the road, not to install signs. 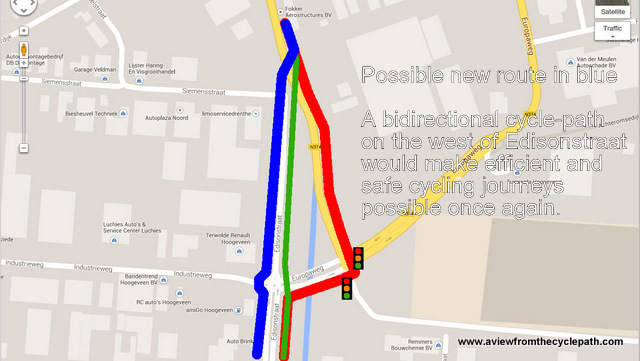 Note that this new junction design is not only dangerous for cyclists, but for all road users. There have also been crashes between cars at this junction. However the consequences are always more serious when vulnerable road users come into contact with motor vehicles. Good infrastructure design is important. Bad cycling infrastructure design isn't merely an aesthetic problem. It's not something which matters only to fussy campaigners. Badly designed infrastructure kills people. There are many aspects of what makes up good infrastructure, and nice new red asphalt is but one of them. An efficient direct route with an older surface is far more useful to a cyclist than a super smooth detour which is designed to look nice. 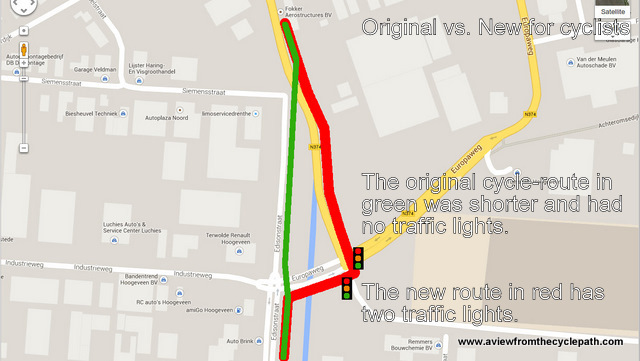 Unfortunately, the new design in Hoogeveen scores well so far as minor issues are concerned (smooth red asphalt, countdown timers on traffic lights) but less well on the important issues (direct route, not waiting at traffic lights). Removing the existing direct and safe route by bike and replacing it with a choice of indirect and safe or direct and dangerous presents people with a choice which no-one should have to make. i.e. get to work on time vs. perhaps not get to work at all. Never present a choice of efficient but dangerous vs. inefficient but safe. Everyone will find themselves tempted by the fast but dangerous route at some point in time. Usually cautious adults late for a meeting, reckless children fearful of arriving late at school, and anyone who simply gets fed up with extra delays will opt for the dangerous route. Design should always take real human behaviour into account. 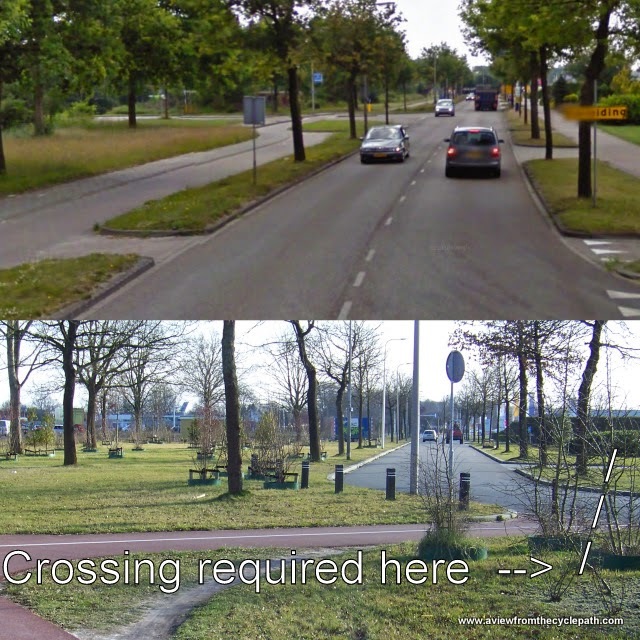 The path through the grass illustrates that not only is the more dangerous route popular, but also that the designed corner radii at the junction between cycle-paths is far too small. There are many posts on this blog which illustrate the types of infrastructure which work best to make cycling efficient and safe. Much of the Dutch success is based on building of good cycle-paths everywhere they are required. Unfortunately, mistakes like this are made. It's important not to assume that cycling infrastructure is good just because it's Dutch.